How to choose the right style of pergola designs for your garden in Broward County? Pergolas are a fantastic addition to any garden or landscape because they draw the eye upward and add visual interest. Pergolas also provide an excellent support structure for climbing plants, and when paired with a flowering vine, they allow your garden to literally climb to new heights. There are as many different pergola designs as there are ideas; your imagination is the limit, especially if you are going to build the structure yourself. In this article, we’ll discuss some popular pergola designs and how you can choose one that’s right for your garden. Pergolas are a unique structure because they can vary a lot in size. Unlike arbors, which are typically no deeper than 3 feet and no taller than 7 feet, a pergola could be large enough to cover an entire deck or patio. Pergolas can also be designed in a variety of ways, depending on your needs. For example, if you are looking for something to provide shade or shelter in a particular area, you might want to use canvas or another material to stretch over the top part of your pergola. Allowing foliage to grow up a pergola is also quite common, and grape vines can be an excellent choice for covering the top of a large pergola because of their tendency to grow horizontally and span a large area. Remember that grapes and some other fruit bearing and flowering vines will attract bees and other insects, so if this isn’t what you want, you may want to steer toward a vine that doesn’t produce fruit or flowers. Smaller pergolas are very similar to garden arbors, except that their tops are flat instead of arched. Small pergolas are also very commonly used in gardens and landscape designs and are great for marking an entry or exit from one place into another. For example, you could use a pergola with a gate along the line of a fence to mark the entry into a side yard or back yard. These structures are often designed with latticed sides, making it easy for climbing vines and other plants to catch hold and grow up the structure. Another unique type of pergola design is one that incorporates a garden bench or seat underneath. Any pergola that has two sides extending down to the ground can be used to support a bench. Simply add some horizontal pieces of wood (or whatever material you’re using) to form a bench seat and back, and you’ll instantly have a cozy nook for reading or relaxing in your garden. In addition to using pergolas as a support structure for climbing plants, they can also be used for suspending hanging flower baskets or various types of garden art, such as pinwheels or other wind-powered mobiles. Garden art such as sun dials, metal stars, or even decorative thermometers can also be mounted to the sides or front of the pergola. Other ways of making a pergola more visually interesting might include painting or staining it a vibrant color, or even painting a design onto the wood. The sky is the limit when it comes to ways you can design your pergola. Regardless of what you choose, you want to be sure that the end structure reflects your personal tastes and compliments the overall style of your home. 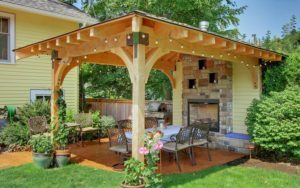 A really unique and interesting pergola does more than just provide shade or a place to sit: it enhances your overall landscaping plan and improves your home’s curb appeal. With a little time and effort, you’ll end up with a pergola you can enjoy for many years to come.